Luke James admitted he was glad to put a "complicated couple of weeks" behind him after making his Peterborough debut following his move from Hartlepool. 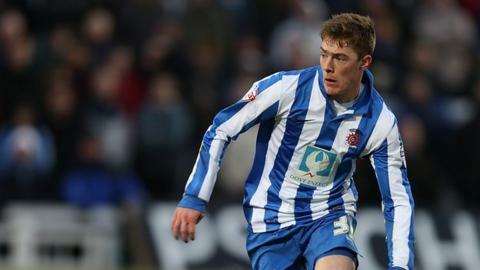 The 19-year-old signed a four-year deal with Posh on deadline day, having handed Hartlepool a transfer request. "As soon I knew there was truth in rumours that Peterborough wanted me, I was over the moon. "This is a team going places and hopefully I can be a part of that," James told BBC Radio Cambridgeshire. The forward and fellow new signing Marcus Maddison both scored for Peterborough on Tuesday evening, in the 3-2 loss to Leyton Orient in the first round of the Johnstone's Paint Trophy. Despite the result, James is confident he will be able to help get Peterborough back on track when they face Port Vale on Saturday in League One. "I am glad to get off the mark, but it would have been better if we had been able to get the win and get into the next round. "Strikers love goals, so if I can score as many goals as I can then that's good for me, but the most important thing on Saturday is three points on the back of a defeat."